Free before 10pm, $10 after + a bonus $100 drink card for groups of 10. Ph: 9388 0222 • parking avail Edward St.
Melbourne’s Biggest Mid Week party. Melbournes premier Party DJ spins all your favourite 80’s & 90’s anthems plus a special live set from Australias biggest 80’s tribute STAND & DELIVER. 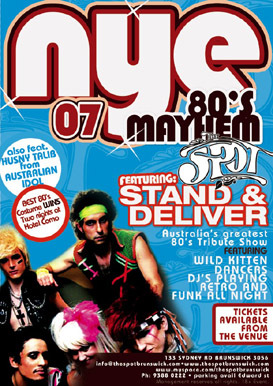 Dance your way into the New Year in pure 80s style with STAND & DELIVER. Known as Australia’s greatest 80s Tribute Show, featuring Australian Idol’s Husny Talib, they will be belting out tracks such as Prince, Madonna, Duran Duran, Starship to name a few. accommodation including breakfast at the Hotel Como, Toorak. 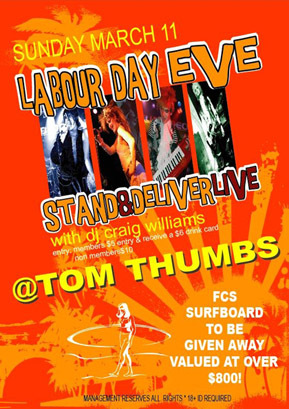 FCS Surfboard to be given away valued at over $800! 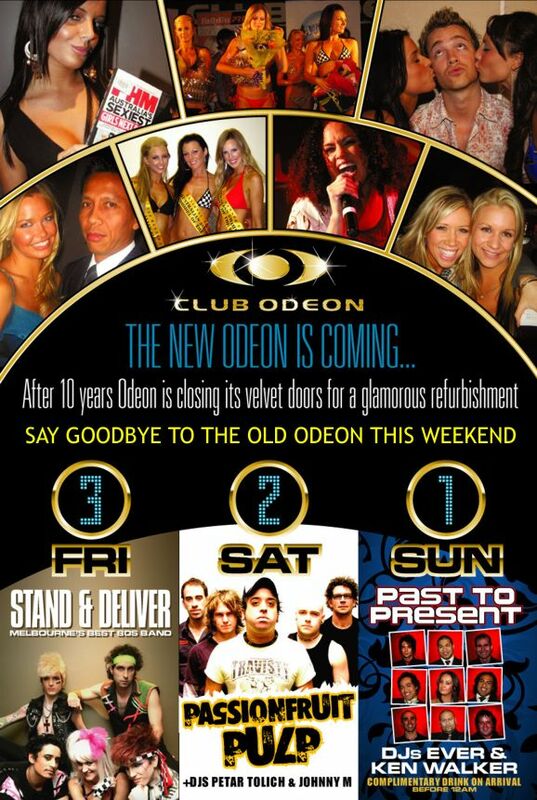 Open 7 days/nights from 11am ‘til late. bagging S&D but they seem a little bit fake at times, just my opinion though. Check them out but go and see 80's Enuff if you are serious about the 80's. some awesome music, i just love it! Stand & Deliver at The Spot! see the band perform the past 3 Sat nights, and have so much fun. THANKS!!! to be!! even during the week check it out! !